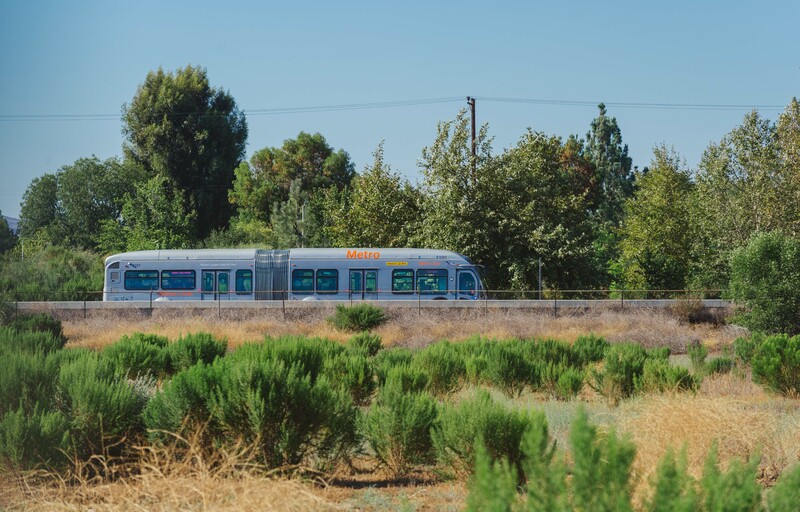 ART OF TRANSIT: The Orange Line crosses the Sepulveda Basin. Photo by Steve Hymon/Metro. Probably not, says writer Binyamin Appelbaum. Host cities end up spending far too much on new stadiums and venues that are often under-used once the torch moves on. The 1984 games in Los Angeles, however, are cited as an example of a lean Olympics effort that turned a profit. It’s a relevant topic, given the interest show by L.A., San Francisco, Washington D.C. and Boston in possibly hosting the 2024 Summer Olympics. My prediction: there is a -100 percent chance that D.C. will get the Games based on world politics + humidity. Some cities view bike lanes for millennials as an economic development tool as millennials are more likely to live in cities and want alternative means to travel to work. The blogger says “interesting,” but not a substitute for other economic tools that cities should supply businesses. Looks like more luxury hotels are coming to the venerable Sunset Strip. Traffic concerns by neighbors are only briefly mentioned, perhaps a sign that it’s hard to get too anxious about traffic in a part of town that has seen heavy traffic congestion for 50-plus years. Cool pics taken with a camera mounted on a quadcopter. These things are great for some really unique vantage points photo-wise. In case you’re thinking how these might capture images of the natural world, perhaps think again — the National Park Service (wisely, IMO) banned the drones earlier this year citing existing federal law. As is often the case in local-federal conflicts in the West, one of the disputes involves the right to drive on roads that had previously been closed to protect the environment. The new limit from 59th Street to 220th Street is lowered from 30 mph to 25 mph. As a former resident of Gotham and based on several long ago cab rides, I had no idea that there was any speed limit on Broadway. Go Metro Gold Line to Rihanna and Eminem! The reason why LA’s 1984 Olympic Games and USA’s ’94 World Cup were successful (and profitable) is actually simple: the facilities were already in place. Unlike Boston, Washington and San Francisco, Los Angeles already has existing facilities needed to host a third Summer Olympics and, in my opinion, should return the Games to the United States for the first time since Salt Lake City’s 2002 Winter Olympic Games. “Trains do receive priority, but I understand how it feels like they don’t. Believe me, I take the Expo Line almost daily. Signal synchronization is an ongoing effort that requires collaboration between both Metro and LADOT. Unfortunately, I don’t have specific information for you right now, but I can inquire at work and find out if you’d like. I’m not sure how to respond given that it’s anonymous post over on reddit. The gist of the comment is basically on target. Expo trains do have “transit priority,” meaning that minor adjustments can be made to traffic signals when a train is approaching — think of it as providing a window when trains can get a green light. The problem is that a number of factors can interfere with this: pedestrians activating walk signals, operators slowing for any reason (usually out of caution). That can throw trains off schedule, meaning they miss their window to get a green. There are also challenge for NB Expo trains at the junction at Washington and Flower, where the Blue and Expo tracks merge — in the middle of a busy intersection. If trains on either line show up a little off schedule, that can interrupt the flow of trains on the Expo Line. The rail operations folks here say they continue to work with LADOT to fine-tune the system. It’s probably worth noting that there are also traffic signal synch issues along the Eastside Gold Line, Pasadena Gold Line (the Marmion Way stretch) and the Orange Line busway. We’ll see how things develop. My feeling is like other things in life, there is always room for improvement, although the number one priority with any street running will always be safety. Any major event, especially the Olympics is a double edge sword. In the case of L.A., if the transportation system does not linked smoothly between the airports and the sporting venues, L.A.’s image could be tarnished. I can see that coming when you spend half a day to travel from Dodger’s Stadium to the Honda Center by transit. And at any rate, a “grade-separated crossing” is a flyover, like the Blue Line at Firestone (or a short subway segment, like the Figuerroa Tunnel on the Expo Line). An at-grade crossing that is protected by gates (even on all sides) is still an at-grade crossing. It takes about 45 minutes to travel between Downtown L.A. (Dodger Stadium) and Anaheim (Honda Center) on the train. A little over an hour if you include the shuttle from Dodger Stadium.